Robin van Persie will undergo a scan on his knee today to discover the extent of the injury which forced him to be substituted in yesterday's Carling Cup final. Manager Arsene Wenger told reporters after the game that Arsenal's vice captain picked up the injury when he scored the Gunner's goal. The Dutch international wasn't expected to play against Leyton Orient on Wednesday but is in contention for next Saturday's Premier League games at home to Sunderland, depending on the results of the scan. Wenger isn't due to speak to the media again until after the FA Cup game, with the only pre-match interview being given to Arsenal TV Online, so official news of the length of van Persie's possible absence through injury will not be unknown until then. 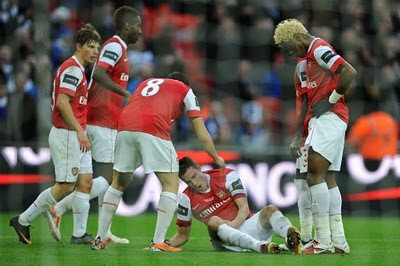 Hopefully van Persie will be back for the Sunderland game.